At-A-Glance daily desk calendar refill is sure to help keep you up-to-date and organized all year long. Covers 12 months January - December making it the perfect resource for year round planning purposes. Scheduling appointments is made easy with this refill, which features half-hourly appointments, 7: 00 a.M. To 5: 00 p.M. And two pages per weekday with full weekends for detailed scheduling. Past, current and future months reference is included for additional planning perspective. This refill fits standard 17-style bases with 2 rings. Each page: 3-1/2" x 6". overall size: 3-1/2" x 6" x 1". 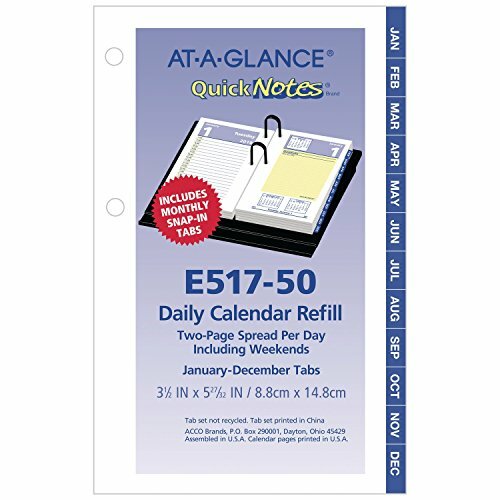 At-A-Glance QuickNotes daily desk calendar refill is sure to help keep you up-to-date and organized all year long. High-quality paper features superior ink bleed resistance. Covers 12 months with a two page per day spread with full weekends. Planning appointments is made easy with half-hourly appointments, 7: 00 a.M. To 5: 00 p.M., with a full line of writing space for each hour. Appointment space is on the left hand page and the QuickNotes writing area for jotting down to-do’s, meeting notes, contact info and more to stay perfectly organized is on the right. Includes past, current and future month reference for planning. Monthly tabs make it easy to find any month or date. This refill fits standard 17 style bases with 2 rings. Each page: 3-1/2" x 6". 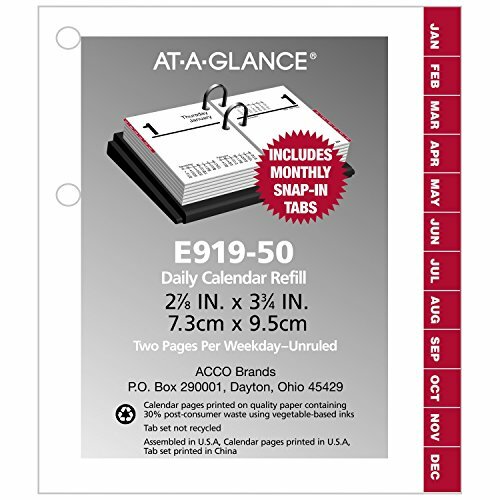 At-A-Glance daily desk calendar refill is sure to help keep you up-to-date and organized all year long. Refill covers 12 months January - December and features two pages per day with full weekends. Half-hourly appointments, 7: 00 a.M. To 5: 00 p.M. For detailed scheduling on the left hand page, with blank notetaking space on the right hand page. One tab per month allows for easy referencing of dates. Includes past, current and future months reference for planning and scheduling purposes. This refill fits standard 17 style bases with 2 rings. Each page: 3-1/2" x 6". overall size 10-3/4" x 8-1/2" x 2-1/2". dates and tabs are Red to add a pop of color. Classic yet contemporary, this high-impact black plastic desk calendar base has two rings to secure standard, 17-style loose-leaf calendar refills (sold separately). 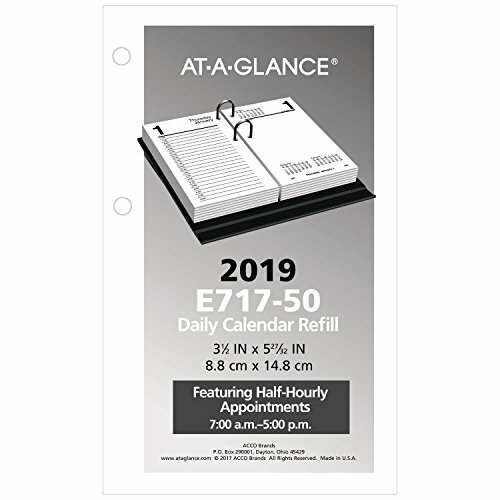 At-A-Glance compact daily desk calendar refill is sure to help keep you up-to-date and organized day by day all year long. Covers 12 months January - December and displays two unruled pages per weekday with Saturday and Sunday combined for detailed scheduling and notetaking. Includes monthly tabs with one tab per month allowing for easy referencing of dates. Features past, current and future months reference to assist with planning and scheduling. This refill fits standard E19 style bases with 2 rings. Printed on quality paper containing 30% post-consumer material. Each page: 3" x 3 3/4". overall size 3 1/4"x 3 3/4" x 1 1/4". 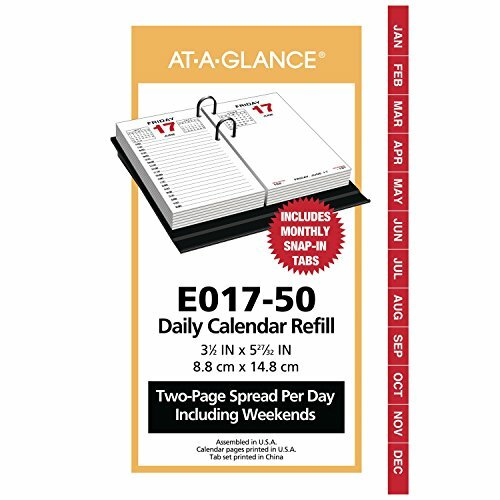 At-A-Glance daily desk calendar refill is sure to help keep you up-to-date and organized all year long. Covers 12 months January - December making it the perfect resource for year round planning. Scheduling appointments is made easy with this refill, which features half-hourly appointments, 7: 00 a.M. To 5: 00 p.M. And two pages per weekday. Past, current and future months reference are included for additional planning perspective. 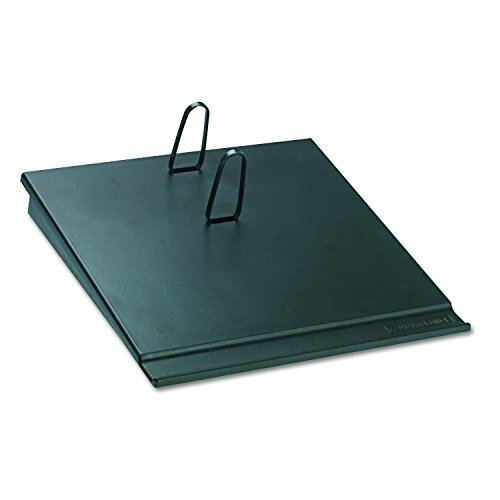 This refill fits standard 17-style bases with 2 rings. Each page: 3-1/2" x 6". overall size: 3-1/2" x 6" x 1". 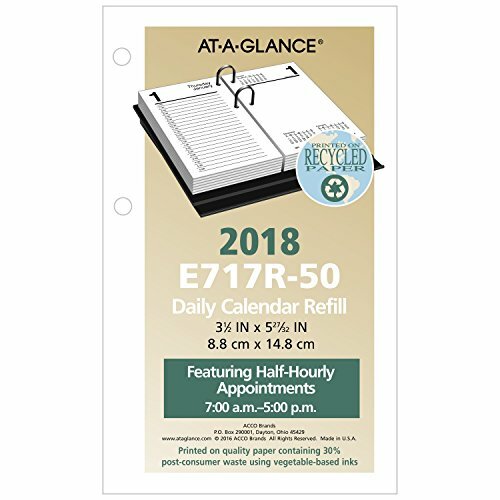 At-A-Glance daily desk calendar refill is sure to help keep you up-to-date and organized all year long. Covers 12 months from January to December allowing you to keep up-to-date all year. Scheduling appointments is made easy with this refill, with two page per day spreads with half-hourly appointments, 7: 00 a.M. To 5: 00 p.M. Monday-friday; one page with hourly appointments 8: 00 a.M. - 5: 00 p.M. Saturday and 9: 00 a.M. - 4: 30 p.M. Sunday. Includes one tab per month making it easy to reference any month or date. 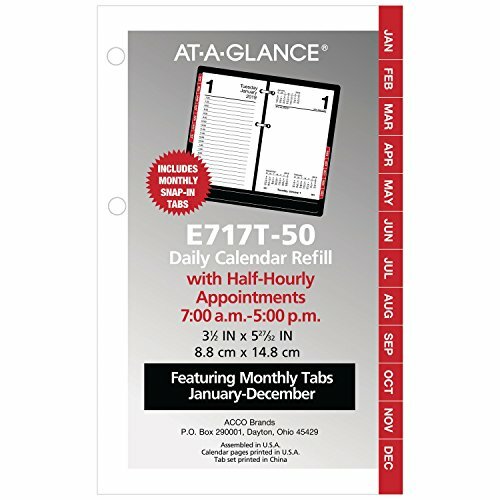 Tab set is printed in Red and is lined for easy organization with projects, to-do’s and reminders. Fits standard 17 style bases with two rings. Each page: 3-1/2" x 6". overall size 3-3/4"x 6" x 1-1/8". 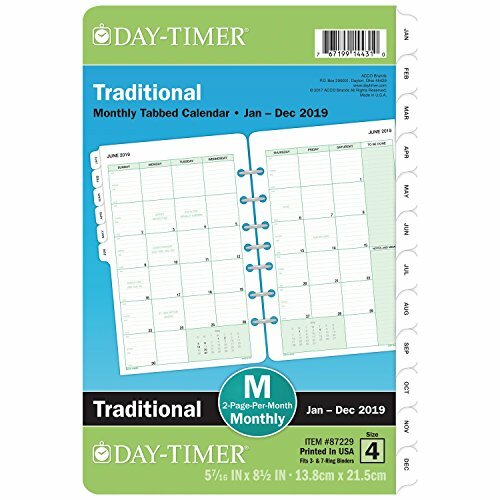 Looking for more Loose Leaf Desk Calendar Refill similar ideas? Try to explore these searches: Love Heart Dangle Silver Charm, Raccoon Screen, and Non Skid Deck Cleaner.